The test for an SI is that it executes client orders outside on an organised, frequent systematic and substantial basis. However, it get’s complicated, when an SDP offers agency trading, acting as a neutral ‘matched-principal’, where in effect the bank is ‘white labeling’ another bank’s rates and providing back-to-back execution against an upstream liquidity provider and earning a fee, either as brokerage, or in terms of an added margins around another bank’s pricing, instead of earning the bid-ask spread and taking principal risk. This could be deemed multilateral, and fall outside of the SI remit, and force the bank to register as an OTF. Bank’s wanting to offer both SI (deploying it’s own capital), and agency execution in the form of matched-principal, could be forced to create a new legal entity to house the hybrid entity. “A systematic internaliser should not be allowed to bring together third-party buying and selling interests in functionally the same way as a trading venue. 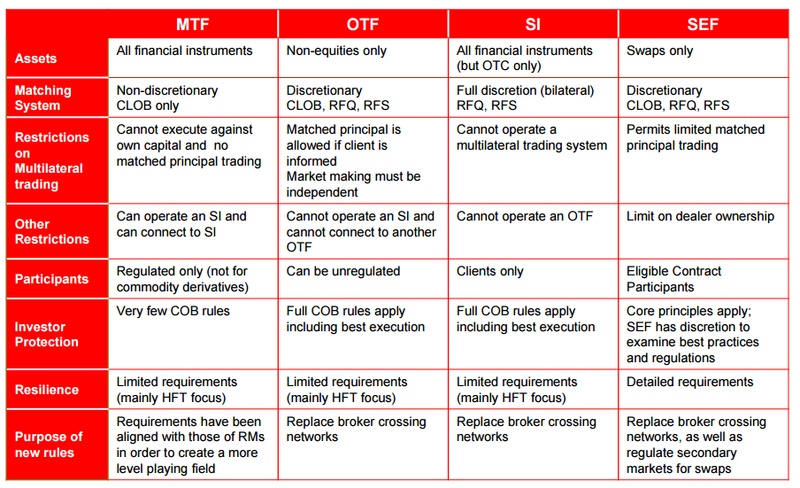 A systematic internaliser should not consist of an internal matching system that executes client orders on a multilateral basis – an activity which requires MTF authorisation.